Florida authorities have linked six more deaths to Hurricane Michael, raising the state's death toll to 35. The storm's overall death toll now stands at 45, with 10 deaths in other states. Florida Emergency Management Division spokesman Alberto Moscoso said in an email Saturday that two more deaths were confirmed in hard-hit coastal Bay County, raising the total there to 21. Florida's latest update also raises the toll in Jackson County to three deaths, and it adds three deaths in Washington County. 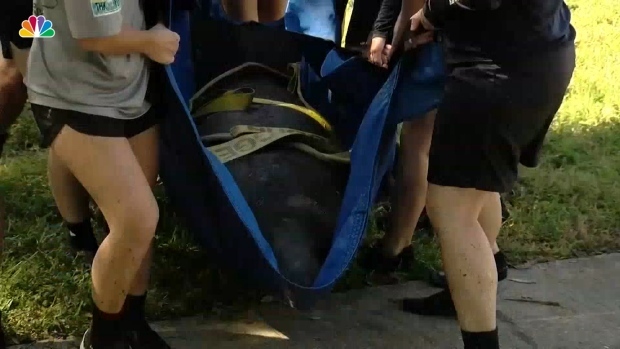 Rescuers helped three manatees return to Tampa Bay after Hurricane Michael’s high tides trapped them in a Florida pond. Gulf County had three deaths, Gadsden County had two deaths, and Clay, Liberty and Calhoun counties each had one death. State emergency management officials tally storm-related deaths from rulings from district medical examiners. Michael slammed Florida's Panhandle on Oct. 10, and also affected Georgia, the Carolinas and Virginia.